Our work on the observation and detailed theoretical description of Rydberg polarons has been published in the Physical Review Letters and Physical Review A. The simplest neutral diatomic molecule, H2, is made of two hydrogen atoms. One can imagine trying to add more hydrogen atoms to build larger molecules, but this does not work, because, unlike lego pieces, atoms cannot be attached to build arbitrary structures using traditional chemical principles. This limitation can, however, be overcome at temperatures on the order of a millionth of a degree above absolute zero, where physicists have learned to bind seemingly arbitrary numbers of atoms together. The trick is to bind them to a highly excited atom, called a ‘Rydberg atom’ where a single excited electron can serve as the binding agent. A collaboration of experimentalists at Rice University and theorists at the Max-Planck Institute for Quantum Optics, Germany, Harvard University in the US and the TU Vienna in Austria have pushed these ideas to their limits and observed that when enough atoms are involved, a new structure emerges, termed a Rydberg polaron. The joint results have now appeared in the Physical Review Letters and Physical Review A. The Rydberg polaron represents a new class of quantum many-body state whose existence had been predicted in 2016 by Richard Schmidt (now at MPQ Garching) and coworkers at Harvard University. It is best described by treating the Rydberg atom as an impurity immersed in a background gas. In general a single particle immersed in a background of other particles can display surprisingly complex phenomena. Under the right conditions, the impurity can form a collective object with the surrounding environment known as a polaron. A common example, first suggested by Landau in the 1930’s, is an electron moving through a solid where the entanglement between the electron and nearby ions can dramatically alter the material’s electrical conductivity. 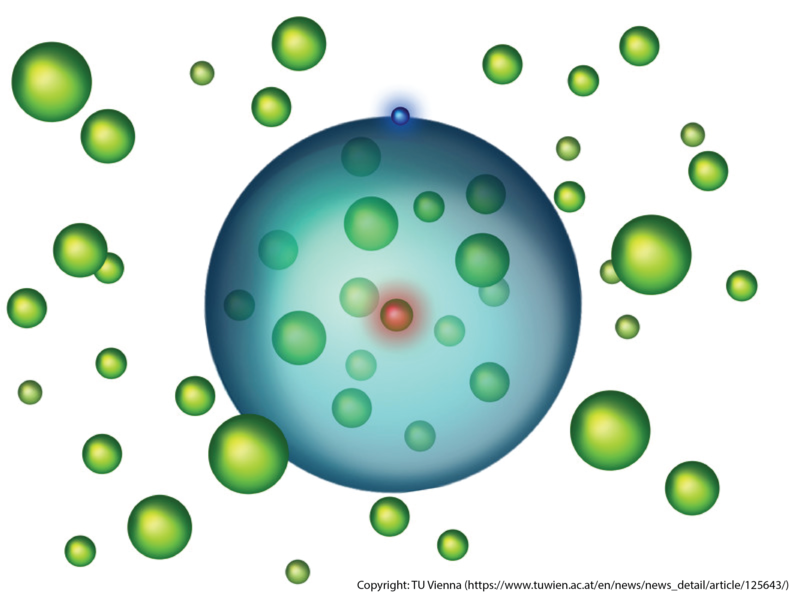 A Rydberg atom by itself is a fascinating object consisting of a very weakly bound electron orbiting at extremely large distances from the ionic core of the atom. The nearly free electron interacts strongly with atoms in the background gas, binding them to the Rydberg atom in molecular states unlike anything seen in traditional chemistry. To explain Rydberg polarons, the theorists at Harvard University and TU Vienna had to extend the existing theory for polarons in solid-state systems to accommodate a much more drastic perturbation of the system: the collective behavior of the atoms in the gas leads to the formation of a molecular dress around the Rydberg atom that consists of hundreds of background atoms in bound molecular states. This new collective object, the Rydberg polaron then shares properties of both the bath and the Rydberg atom. The discovery of this new polaronic dressing by molecules expands our understanding of polarons in general and is relevant to several areas of physics and chemistry. The generalization of the polaron concept to a much more strongly interacting system paves the way to explore many properties of this novel quantum state such as how dressing changes the mass of the impurity, the nature of polaron-polaron interactions, and the effects of Rydberg-polaron formation in quantum computers based on Rydberg excitations. Read more about media coverage here.